I really don't know if there is a book out there that is more suited to my tastes than this one. I love food and cooking (well, I don't always love cooking--but I love the idea of cooking), I love short story collections (this is a short story collection in novel form, if that makes any sense), and I love the Midwest. So, you know, sign me up. This book lived up to all of my expectations and then some. The mechanics of this book are unique, which is something I don't come across too often. As I said, it is a short story collection in novel form. By that, I mean that each chapter is a distinct chapter, but they are all tied together through the character of Eva Thorvald. So, is Eva the main character? Well, yes and no. She is definitely the axis around which this book turns, but she appears less and less in the book as it progresses. In turn, other characters take center stage as their lives are touched in surprising ways by Eva. Honestly, if someone told me this was how it went, I never would have thought it would work But it does--marvelously. At its heart, this is a story of parents and children, specifically mothers and daughters--but you don't see that until you've read the last word. Stradal is not overbearing with his theme and lets it develop organically over all the stories he includes. I appreciated that I wasn't hit over the head with THIS IS WHAT THIS BOOK IS ABOUT and that Stradal let me discover it on my own. And the food! Yes, there are recipes and I have a mostly love, but a little hate relationship with recipes in novels. I appreciate them but, unless they are collected at the end of the book, I find that they sometimes break up the flow of the narrative. 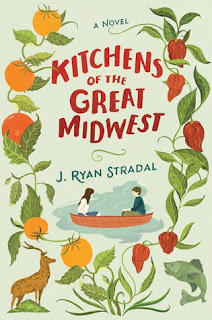 Stradal not only doesn't save the recipes for the end, he puts them right smack dab in the middle of the narrative. Again, this should irritate the heck out of me, but he does it in a way that actually works. This is partly because there aren't that many recipes and also because, when he does include them, it is part of the action of the plot. Oh, and you can bet your bottom dollar that I'll be making Pat Prager's Peanut Butter Bars in the very near future! Let me close with this, several people that I know will most likely receive copies of this book for Christmas. It is that good!